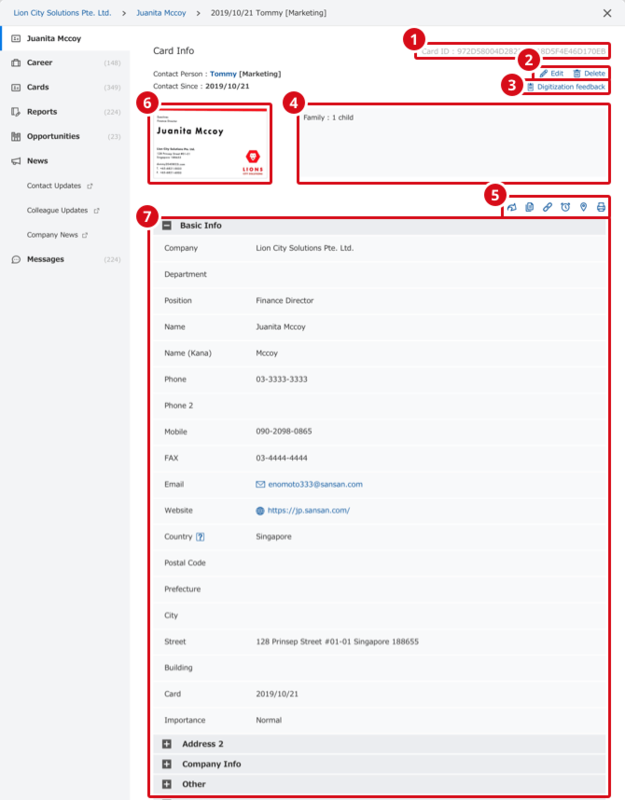 Here we will provide guidance to the Business card details screen, which contains the business card image and the name, company name and other information that are degitized. We will explain the two halves of the screen. For how to access the Business card details screen, see here. This is a value assigned to each individual business card. You may be asked for this to identify a given business card. With this, you can edit or delete the business card This will only be displayed for your cards, or if you have clearance to update all data, for all cards. In the event that there is a mistake in the digitized content of your business cards, please let us know using the Feedback function. Here you can check and update memos connected to this business card. You can use these to display Google maps, print, Share with a colleague, Set Reminders, copy business card information, or copy the URL of the screen. Here you can check the front and back images of the selected business card. The individual items of information on the business card will be displayed. If you click on (+), all the information will be displayed. Here you can check tags added to this card. If you click the X at the upper right of the tag, you can remove the tag. You can create the new tag and add or add existing tags.